Pre-war version from Chernovitz, Romania. Recorded by Itzik Gottesman at the Sholem Aleichem Cultural Center, Bronx 1980s. 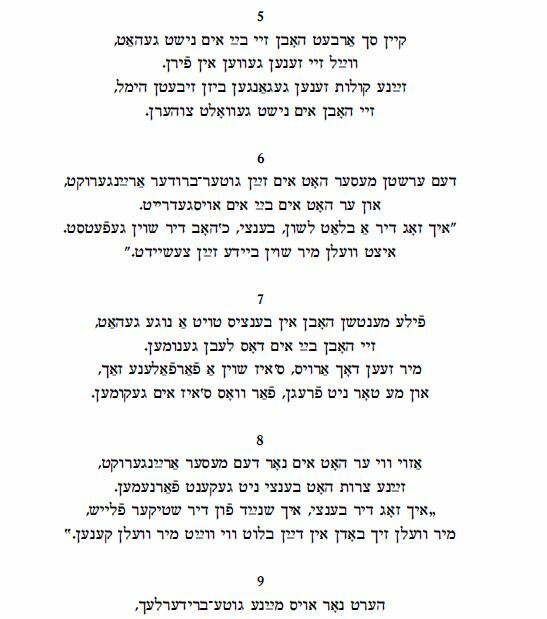 The more popular song version of this poem by Itzik Manger (1901 – 1969) was composed by Hertz Rubin (1911 – 1958) and has been recorded by at least thirteen artists. According to Chana and Yosl Mlotek in Songs of Generations, the singer Masha Benya received that version from Manger’s widow Genia Manger after the second world war in NY. But this earlier version has a different melody, and slightly different words without the “Ekh du fidele du mayn” refrain. BSG learned this song in Chernovitz, which was Romania between the world wars and is now in the Ukraine. Manger’s lyrics carry a number of commonly-held negative stereotypes about Romany (Gypsy) culture. However, considering the time in which he was writing, through first-person narration, Manger creates a sympathetic window into the challenges faced by Roma including poverty, oppression, and a sense of otherness as a minority community. The ever-wandering Manger, no doubt, felt like a kindred spirit. Accordionist Mishka Zignaoff (who was a Yiddish-speaking Russian Rom musician based in New York) recorded the melody as Galitzianer khosid (Galician Hasid) in a medley with the famous Reb Dovidl’s nign. I am posting this song to mark Beyle Schaechter-Gottesman’s 5th yortsayt (1920 – 2013) which falls on the second candle of khanike. Beyle and Itzik Gottesman looking over Yiddish field recordings, 1970s. BSG Spoken: [Itzik Manger] iz geveyn maner a landsman, un hot geredt Yidish vi ekh. Vel ikh zingen in durem-yidish azoy vi er hot geredt. “Ikh bin a tsiganerl a kleyner” un di lider vus ikh zing zenen a bisele, tsi mul, andersh vi ir zingt zey, val ikh ken zey nokh fun der heym. ober vi ir zeyt a sheyner. Ikh veys nisht vi ikh bin geboyrn, bin geboyrn. Fil ikh zikh vi a ben-meylekh. Mayn tatns zifts, mayn mames trern. S’kost in gantsn nor a drayer, nor eyn drayer. S’iz mayn veytik gurnisht tayer. But as you see good-looking. I don’t know where I was born, was born. My mother lost me somewhere in the Steppes. Barefoot, hungry and merry, always merry. I feel like a prince. My father’s sigh, my mother’s tears. It will only cost you three kopecks. My suffering doesn’t cost much at all. 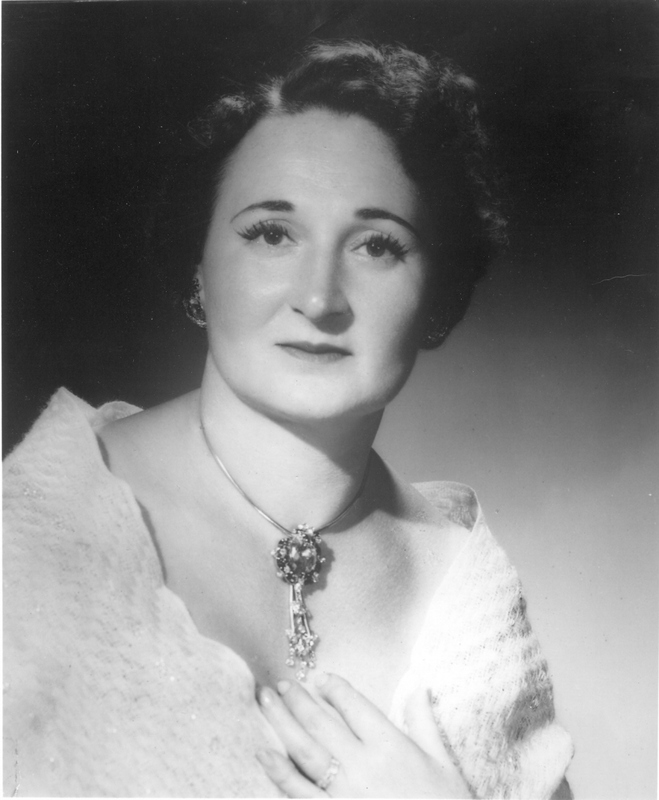 Thanks to Henry Carrey for this fascinating recording of his mother Leah “Leyke” Post Carrey (1908 – 2005), a well known Yiddish singer and actress, singing a 15 verse murder/underworld ballad from Zhitomir entitled “A lid vegn Bentsi der geshtokhener” (“A Song about Bentsi who was Stabbed”). Leah’s mother Frahdl had learned this song right after the actual event, and Leah says in her Yiddish comments spoken after performing the song that her mother attended the trial and saw the bloody knife. What follows is 1) information on the singer Leah Carrey, followed by 2) notes on Leah’s mother Frahdl, from whom Leah learned this song, and finally 3) a few comments on the song itself. Leah Carrey, singer, actress and star of Yiddish radio in Boston passed away last week in New York. Known to her fans by her maiden name of Leyke Post, Leah was born in Zhitomir, Ukraine into a family that loved to entertain. She and her mother Frahdl joined her father Shloyme in the West End of Boston when she was 5 years old. Her stage debut was as a boy singing “Heyse Bapkelekh” in a touring Goldfaden operetta starring Michal Michalesko. On that occasion, she suffered her first and only bout of stage fright. She performed in shows at the Grand Old Opera House on Dover Street, at the Shawmut Theater and the Franklin Park Theater, working with some of the greatest stars of the Yiddish stage. Later, she toured all over New England and in the Catskills, performing Yiddish folk, art and theater songs. She sang on Boston radio for over 25 years on stations WCOP, the Mutual and Yankee networks. She was a regular on “The Kibitzer” with Ben Gailing and “Der Freylekher Kaptsn“. She also concertized for many Jewish organizations – most frequently at the Workmen’s Circle camp in Framingham and Center. In 1933, she married Al Carrey and had two sons: David, who eventually worked in the New York Yiddish theater and Henry. She joined her son in New York in 1978 singing on WEVD, at Circle Lodge and off-Broadway in “The Roumanian Wedding”. After her son David’s untimely death, she was cheered up by the chance to play Grandma in Woody Allen’s film “Radio Days”. In the early ‘90’s, she impressed her audiences at “Klezkamp”. She is survived by her son Henry of Manhattan and her sister Rose Andelman of Nyack, New York . My bobie was born in Zhitomir, Ukraine in 1881 and died at the Workmen’s Circle Home for the Aged in the Bronx, New York in 1976. She grew up in a lower-middle class home, one of four sisters and two brothers. Her father Dovid-Hersh Herman had a shop where grain was sold. His wife, Rivke Kolofsky worked in the shop. As young girl, she always liked to sing and dance (her father was said to be a part-time lay khazn [cantor] with a pleasant voice.) She and her brother, Pinye, teamed up to sing and dance at local simkhes (family celebrations). As she was never taught to read and write, she used to learn everything by heart. She once said that she learned her vast repertoire of many-versed songs by going to a store with friends every day, where newly written songs would be purchased and then shared by the girls (at least one of whom had to be able to read music). She also used stand in the street outside the local jail and learn revolutionary songs from the prisoners who could be heard through the windows. Although she remembered attending revolutionary meetings in the woods, she was not an activist. She also took part in occasional amateur theatricals near her home. One day she went to a fortune-teller, who told her that her future husband was waiting at home for her. When she got home, she saw my grandfather Shloyme, who had been boarding with her aunt. Even though she was supposed to be the prettiest of the girls, she was relatively late in getting married for a girl at that time. In 1907, they married and within a year, her husband Shloyme was off to America to seek his fortune. He may not have known that his wife was pregnant when he left. I don’t know if he left for any other reasons, but I do know that there were pogroms in Zhitomir in 1905 and 1907. In April 1913, (from Halifax) they left for Boston, where my grandfather had settled. Frahdl had two more children Rose and Hymie. My grandfather worked as a welder and a blacksmith and eventually owned two small apartment building where he was the landlord and super. At one point, they left their Jewish neighborhood of the West End of Boston to move to Arlington so that my grandfather could open a tire store with a friend for Model T’s. Being one of four Jewish families in Arlington, my mother and siblings were influenced by the gentile kids around them. My aunt and uncle once brought a “Chanukah Bush” home and put up stockings on the mantel. My grandmother threw the tree out and filled the stockings with coal and onions from “Sente Closet“. My mother, who even at a young age, was a singer, had been secretly singing with the Methodist choir. One day, the minister came to the door to ask my grandmother’s permission to allow my mother to sing on Christmas Eve. That was the last straw for my grandmother and they moved back to the West End. I was always amazed that my grandmother managed to bring up three children in Boston without ever learning to read or write. She could recognize numbers and sign her name, but never went to night school as her sisters had done. She always regretted that. My grandmother always sang around the house both the old Yiddish and Ukrainian folksongs she had learned in Zhitomir and the new Yiddish theater songs she heard from other people or later on the radio and on recordings. She never stopped singing and dancing even in the old age home. I remember even in the 1960’s she would delight people with her Yinglish version of “How much is that doggy in the window?” or her renditions of “Enjoy Yourself (It’s later than you think)” in Yiddish and English and “Der Galitzianer Cabalyerl“ in Yiddish. 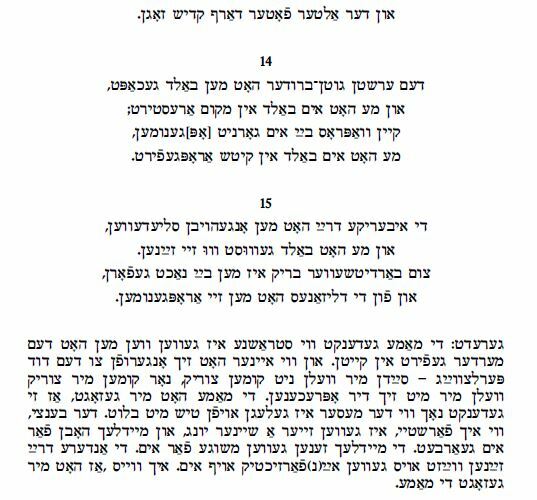 This song is among the more brutal and bloodier Yiddish ballads even when compared to the songs in Shmuel Lehman’s classic collection, “Ganovim lider” (“Thieves’ Songs”), published in Warsaw in 1928. Interesting how even in such a prime example of the Jewish underworld, elements of the traditional Jewish world work themselves into the story – his pal Dovid Perltsvayg and his old father say Kaddish (the memorial prayer); Bentsi wants to say vide, his final confession. Elements of traditional Yiddish ballads also are to found, such as verses that begin with “Azoy….” – “Azoy vi di muter hot dos derhet” for example is usually part of the widespread “12 a zeyger ballad” (see the recording by Lifshe Schaechter-Widman on the cassette “Az di furst avek”). I will not comment on the grammatical and lexical issues, which are many, and can be addressed by the listeners of the Yiddish Song of the Week blog. Please point out any mistakes, of course, or disagreements with my translation. vos ikh aleyn vel aykh zingen. Di gantse velt tut mit im klingen. that I will sing for you myself. The whole world is talking about him. geyt men a gutn-bruder fargisn blut. and they always got along fine. they spilled the blood of their buddy. hot er nit gevust vos mit im ken zayn. azoy hot men im gegibn dem meser in der zayt arayn. he didn‘t know what would happen to him. and they stabbed him with the knife in his side. hot er zikh oyfgekhapt mit a groys geshrey. Er hot ongehoybn shrayen “Brengt mir a dokter. Oy, zol men mir mayn blut faromeven”. he woke up with a great yell. vayl zey zene geven in firn. zey hobn im nisht gevolt tsuhern. un er hot im bay im oysgedreyt. “Ikh zog dir a blat loshn, Bentsi, ikh hob dir shoyn gefetst. and he turned it around in him. Now we will go our separate ways. File mentshn hobn in Bentsis toyt a negeye gehat. Zey hobn bay im dos lebn genumen. un me tor nit fregn far vos s’iz him gekumen. Many people had a part(?) in Bentsyes death. They took away his life. but no one can ask why he deserved it. zayne tsores hot Bentsi nit gekent farnemen. Bentsi could not stand his pains. “I tell you Bentsi, I am cutting pieces of flesh from you. Ot hert vos ikh vel aykh zogn. listen to what I will tell you. O, let me say my final confession of sins. iz zi arayngefaln mit a groys geveyn. she ran in with a great moan. God only knows if you’ll see me tomorrow‟. zayne tsores hot er nit gekent aribertrogn. Az kadish zol er nokh im zogn. After the stabbing he lived another seven days. His pains he could not endure. he should say Kaddish for him. er zol zikh zayn krivde onnemen. and asked to take up his cause. oy, darf men veynen un klogn. Aza ayzernem Bentsi leygt men in dr’erd arayn. un der alter foter darf kadish zogn. and his old father must say Kaddish. me hot im bald in kitsh aropgefirt. un me hot bald gevust vu zey zaynen. un fun di dlizones hot men zey aropgenumen. and they soon found out where they were. And from the carriages they took them off. 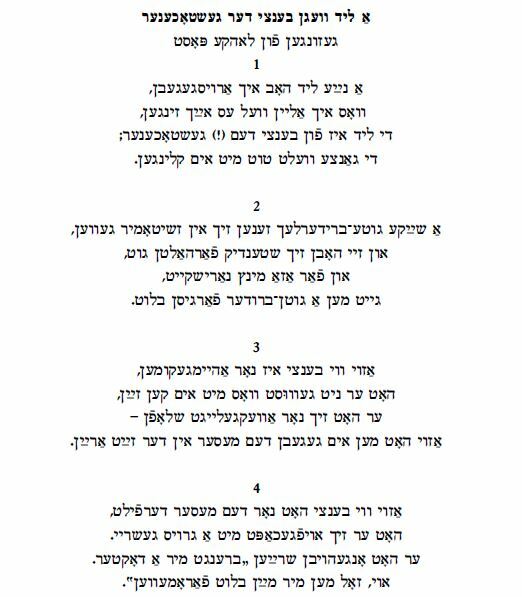 At conclusion of song, this is spoken by the singer: “My mother remembers how dangerous it was when they led the murderer in chains and how one of them yelled to Dovid Perltsvayg – ‘unless I don’t come back if I do come back we will get back at you’. My mother told me that she remembered how the knife was laying on the table with blood. Bentsi, as I understood it, was a handsome youth, and girls worked for him. The girls were crazy for him. The other three, it seems, were jealous of him. I know, that’s what my mother told me. I recorded Ikh vel nit ganvenen (I Will Not Steal) in Mogilev, Belarus, from Sterna Gorodetskaya, born in 1946 into the only Jewish family that got reunited after the war in the village of Komintern, a Mogilev suburb. Sterna is also the aunt of Yuri Gorodetsky, a noticeable young opera singer who was for while involved performing Yiddish songs and cantorial pieces in Minsk, taking part in Jewish cultural revivalist movement there. It was amazing to hear this song from a person of Sterna’s generation. She sang the song to me in memory of her mother, and that was the first time she performed it since she was a child. To realize why it is so unique in that context, it is important to mention that unlike Moldova or Ukraine where the Jewish tradition was preserved to a considerable extent throughout the Soviet times, Belarus saw a much more powerful wave of assimilation, including the loss of the Yiddish language, in the post-war time. Most of the songs sung to us in the course of our fieldwork had been hidden in people’s memory for decades. The song per se adds to a number of other “thief’s songs.” Chaim Kotylanski included two similar songs in his book, “Folks-Gezangen as Interpreted by Chaim Kotylanski,” Los Angeles, 1944. The lyrics of one, Nisht ganvenen nor nemen, resemble Sterna Gorodetskaya’s version in the chorus (compare: “Kholile nisht ganvenen, nor nemen, nor nemen”), though it employs a dance-like or march-like melody set in a major key. The other song, Kh’vel shoyn mer nisht ganvenen, is closer melodically to Sterna’s, as both are set in the natural minor. 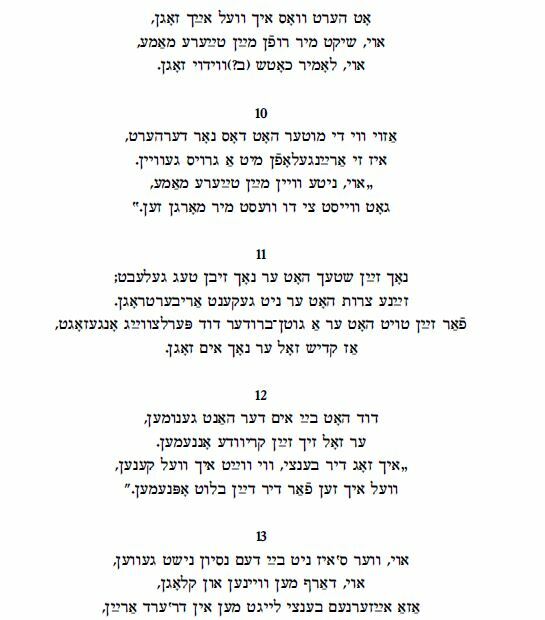 In “Pearls of Yiddish Song” published by Chana and Yosl Mlotek there is yet another variant of ‘Kh’vel shoyn mer nit ganvenen. My trip to Mogilev in January 2008 was the first one to follow the untimely death of Nina Stepanskaya (1954—2007), my professor and colleague with whom I collaborated over a decade on the Litvak music culture research in Belarus. Like Sterna Gorodetskaya who sang this song in memory of her mother, I would like this posting to be a tribute to and a small sign of appreciation of Nina’s invaluable input into Jewish music studies. Un az ikh hob dikh lib, iz ver darf dos visn? Oy ikh val nit ganvenen, nemen aleyn. And whilst I love you, who should know about that? I will not steal, I will only take. Oh I will not steal, I’ll only take. Un az ikh hob dikh lib, iz vemen darf dos arn? And while I love you, whom should it bother? Un ikh mit a tsveytn un du in chakhotke. I’m with a buddy and you have consumption. Un nemen a bisele mashke un take nit zayn shiker. As it should be to have brandy and not to get drunk.